Instability Training: Good or Bad? I was checking out some fitness columns today and I came across an interesting article published in the Washington Post on instability training, or training on unstable surfaces like a physioball (swissball) or a BOSU. Now, everyone is entitled to their own opinions on things, but mis-information is not an opinion…it’s just plain wrong. The article went on to talk about how instability training is effective for training other areas of the body (which isn’t entirely untrue…but there’s more to it than that). Basically, the premise is that training on an unstable surface forces you to use more muscles in the body to stabilize the movement. 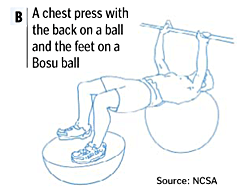 Exercises like “Stability Ball Bench Press” and “Stability Ball Bench Press with Feet Elevated on an Inverted BOSU” were discussed. Seriously, how ridiculous does that sound? Here are some pictures from the article so you can have a visual reference. Please, click on these photos and seriously try to comprehend how foolish it is to do something like this. By the way, the photo credit should go to NSCA but it was incorrectly referenced in the article as the NCSA, as shown on the picture. Another one of my gripes with the overall article content. By lying on a physioball, you truly are creating an unstable surface. You will have to balance by activating other muscles in the body. But the muscular activation will in no way compensate for the decreased weight you’ll have to use OR the risk involved with an exercise like this. Additionally, it’s almost impossible for you to do these exercises on your own. You must have a partner to give you the bar and take it from you when you’re done. Here’s some basic physics for you. The farther from your body the weight is, the more unstable you’ll be. Conversely, the closer the weight, the more stable you become. But, the closer the weight is to the chest, the more difficult it becomes to press and the greater the chance of “sticking” or hitting a point in the range of motion where you can’t effectively move the weight up. If that happens, you’ll most certainly need the help of a spotter. Worst yet, you may need to “dump” the weight. In that situation, you can’t just push the bar off of you as you could on a stable bench. If you do, the ball shoots out to one side, you hit the floor and the weight gets a nice soft landing on your head or torso. The chance of that happening anyway is also a factor. Oh yeah, the ball could burst too. Yes, they’re built to endure a lot of compression, but you won’t have that issue with a bench at all. Now lets look at the second picture. 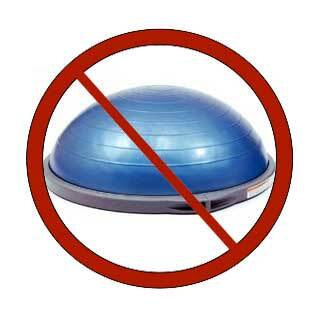 Inverting a BOSU and placing your feet on it will only make you MORE UNSTABLE and not in a good way. Adding the increased instability to the equation will in no way make the exercise more beneficial! This is, unfortunately, a huge misconception in the fitness industry. It’s an industry that thrives on evolution and industry leaders and gurus are constantly looking for the next best thing. Unfortunately, movements like the ones above are the result of that quest. Bottom line: Don’t get sucked into thinking instability training will aid your overall training or progression. 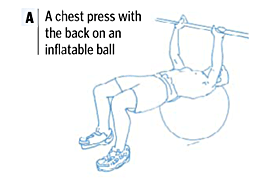 Physioballs have their place, but it’s not underneath you while you’re pressing a weight. 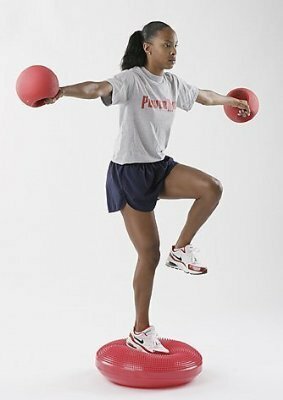 As for standing on a BOSU and lifting weight, all that will make you better at is standing on a BOSU. It won’t carry over to your athletic prowess. Additionally, strength gains will be drastically limited since the very nature of instability training requires you to work with a lesser load. Conclusion: Training on unstable surfaces has it’s place, but instability training is, for the most part, a waste of time when it’s performed as detailed above. Use your head and think about what you’re doing. If it seems ridiculous, it probably is. If you truly want to get stronger, just stick with the fundamentals. If you’re an athlete, work the skill sets of your sport, while developing strength in the gym. The two together will be much more beneficial than trying to stand on a ball.